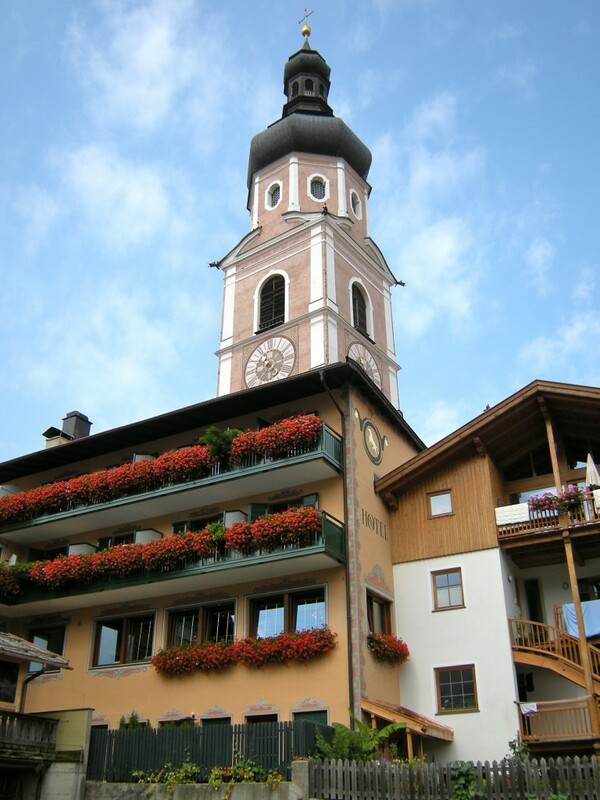 Castelrotto town in the South Tyrol region of Italy. Our home base during the first Dolomites trip (Aug. 2008). 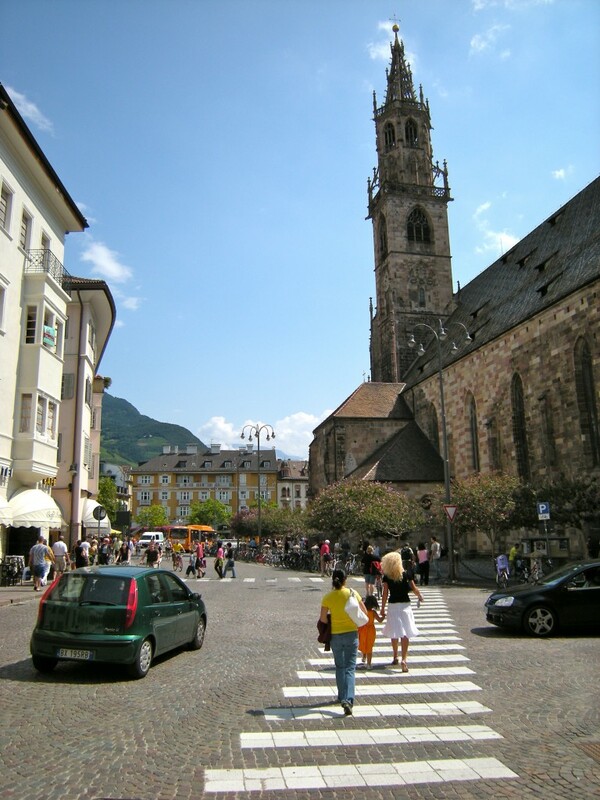 Bolzano in northern Italy. 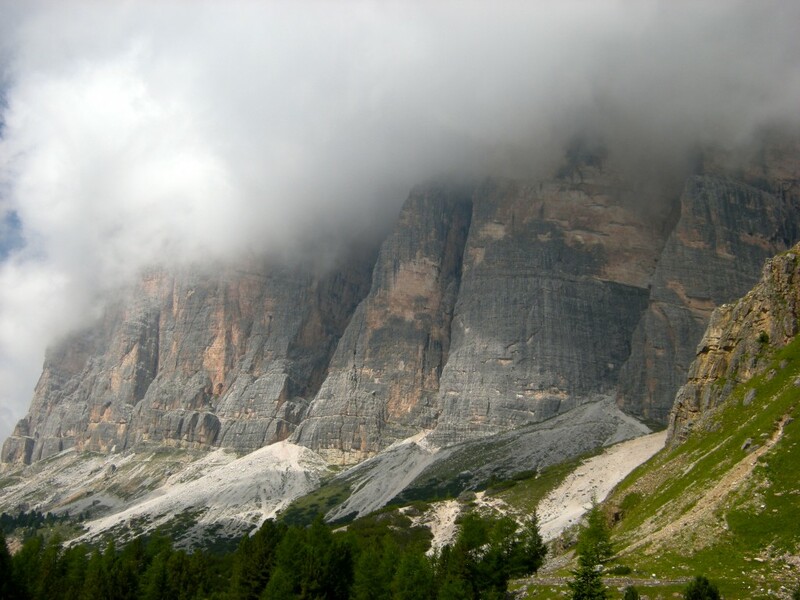 On a marginal weather day we took a drive out there ("gateway to the Dolomites"). 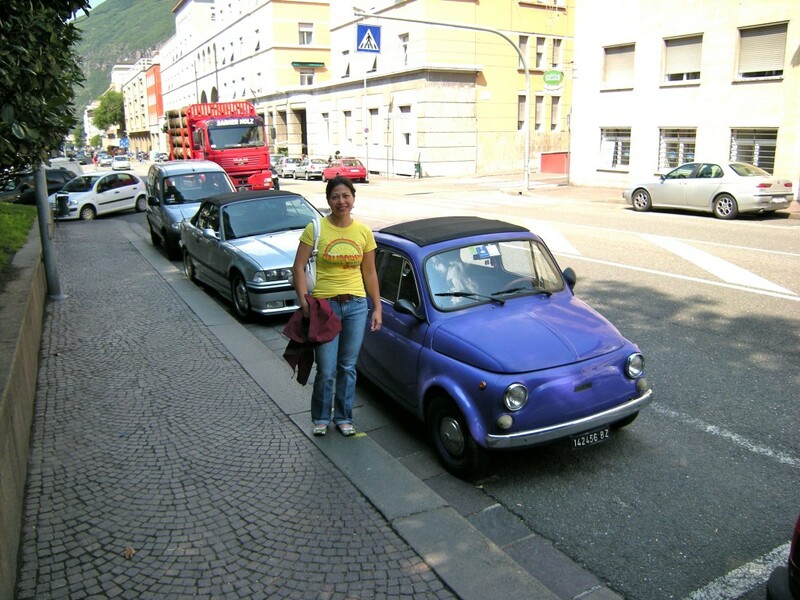 Shirley and a mini Fiat? Citroen? (Aug. 2008). 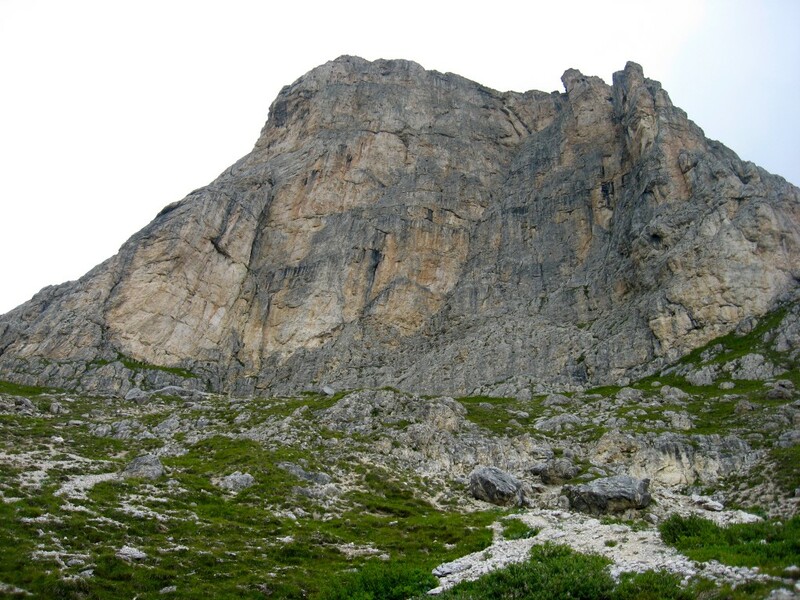 Tofana Di Rozes' south face as seen from Rifugio Dibona. These are the typical conditions we saw until our climb day. South Buttresses 1, 2, and 3 are visible (we'd climb 2 later on the trip; Aug. 2008). 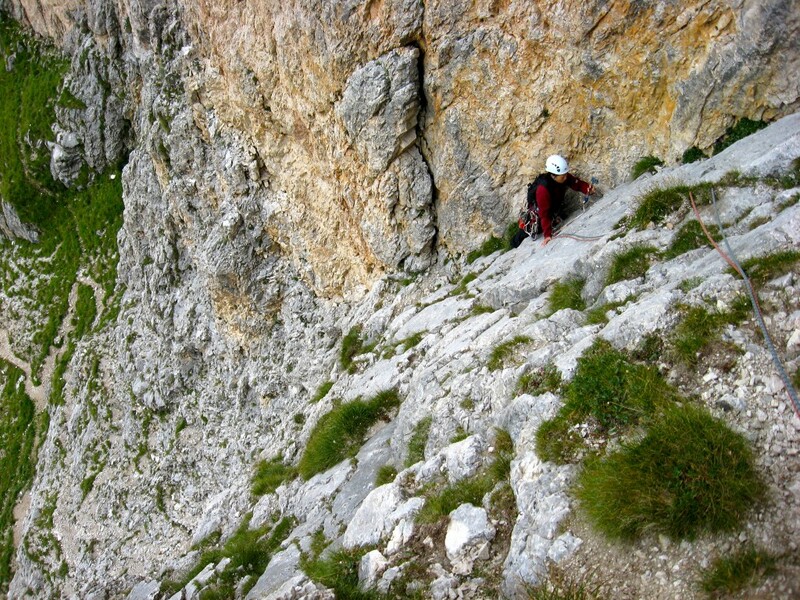 Tofana Di Rozes and its South Face Buttress 2. 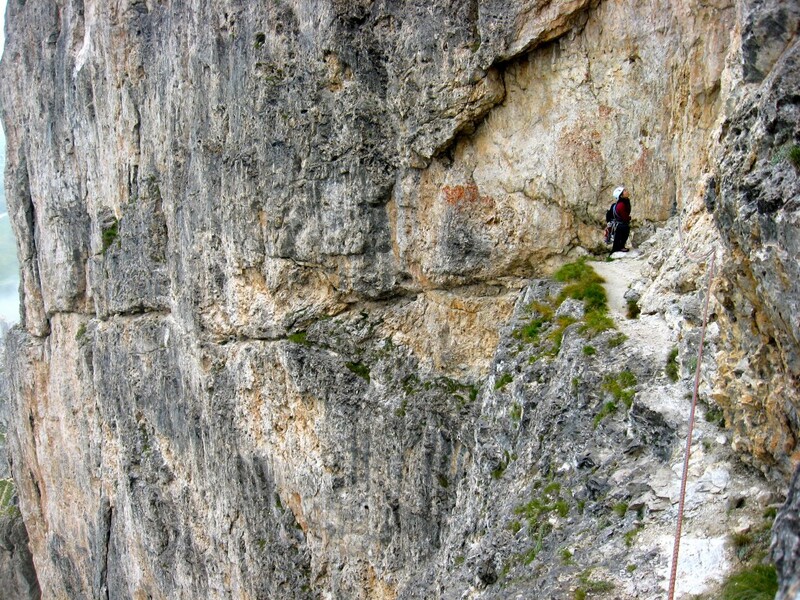 We'd later climb the easier of its two routes, the 18-pitch Pillar Rib (VI-; Aug. 2008). 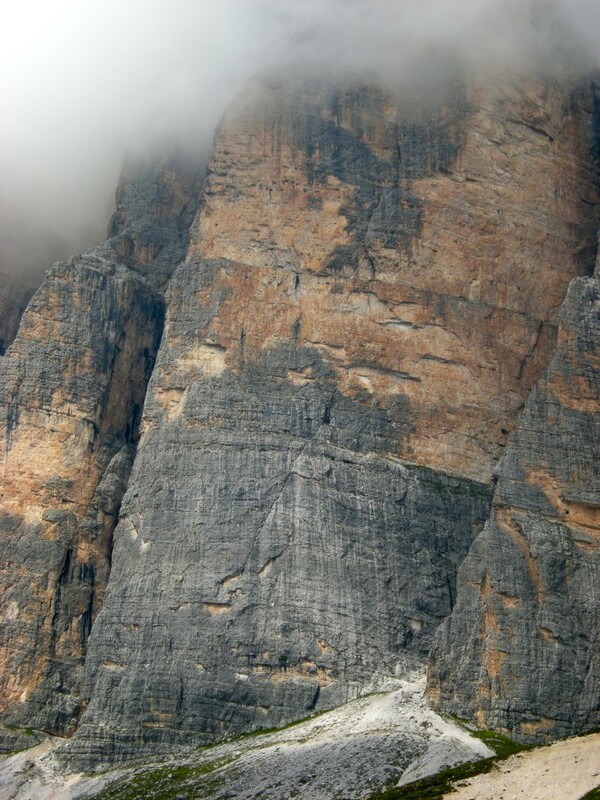 The south face of First Sella Tower. The diagonalling left-facing dihedral on the right (well, center of photo) houses the Trenker route (V-). The right-facing dihedral on the left is the Tissi (VI) route. Both slick and neither particularly enjoyable (Aug. 2008). 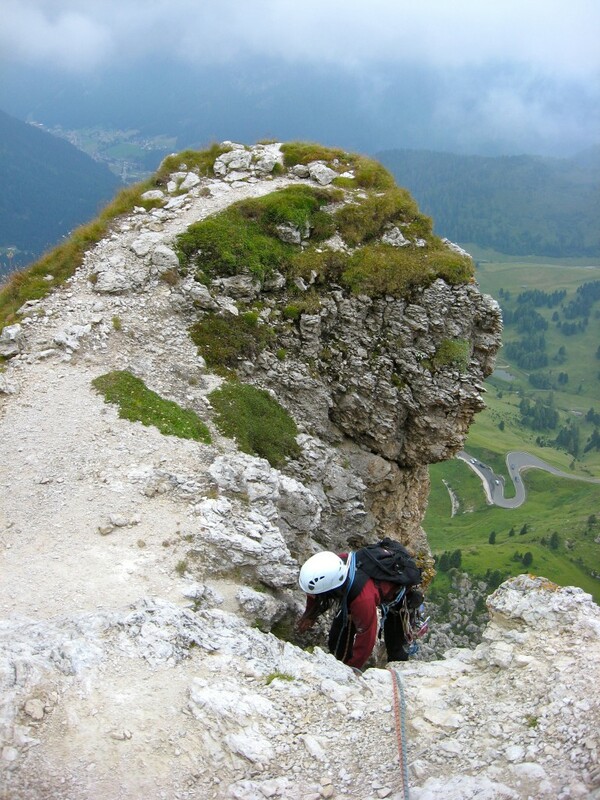 Shirley topping out on pitch 1 of Trenker route on First Sella Tower (V-; Aug. 2008). 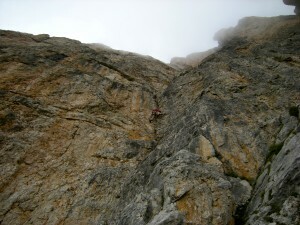 Shirley topping out on pitch 2 or 3 of Trenker...with the light drizzle adding to the alpine ambiance (Aug. 2008). 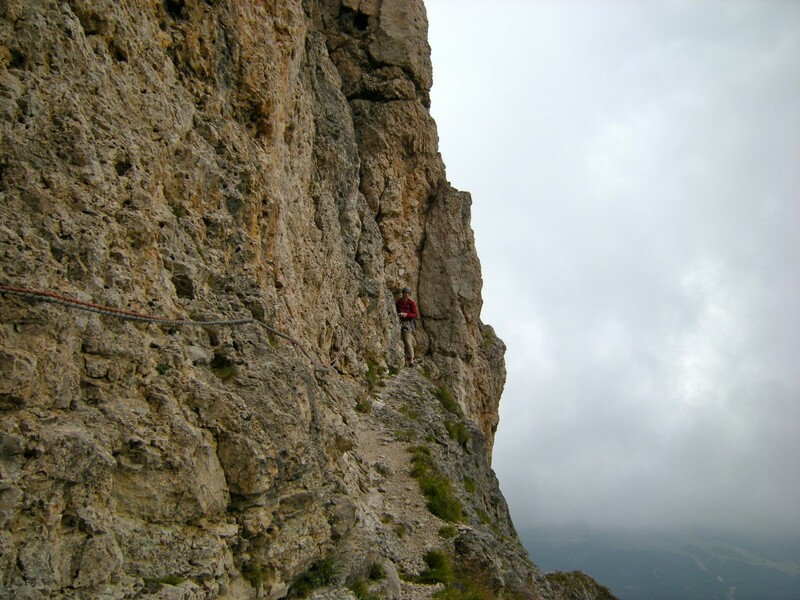 Shirley atop the 2nd or 3rd pitch of the Trenker route on First Sella Tower (Aug. 2008). Leading the 4th (probably) pitch of Trenker route on Sella One (Aug. 2008). 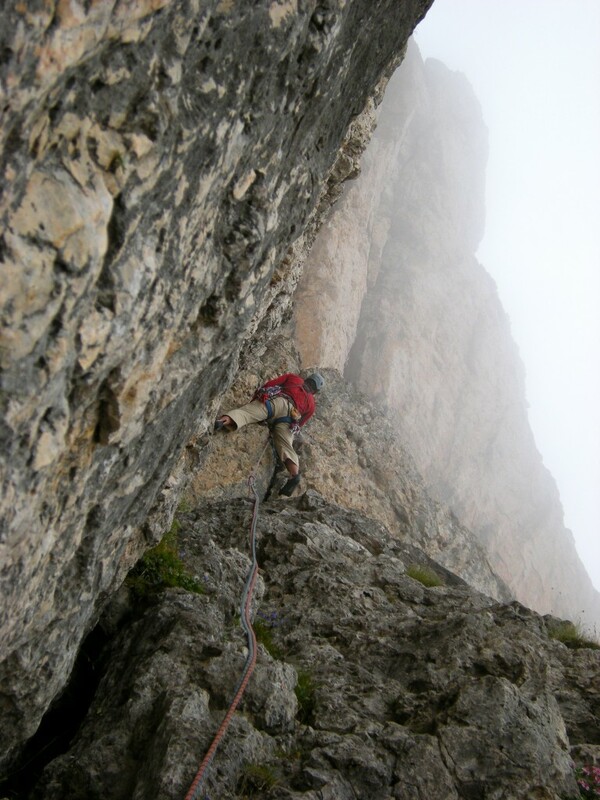 Same pitch - higher and with incrementally shittier weather (Aug. 2008). 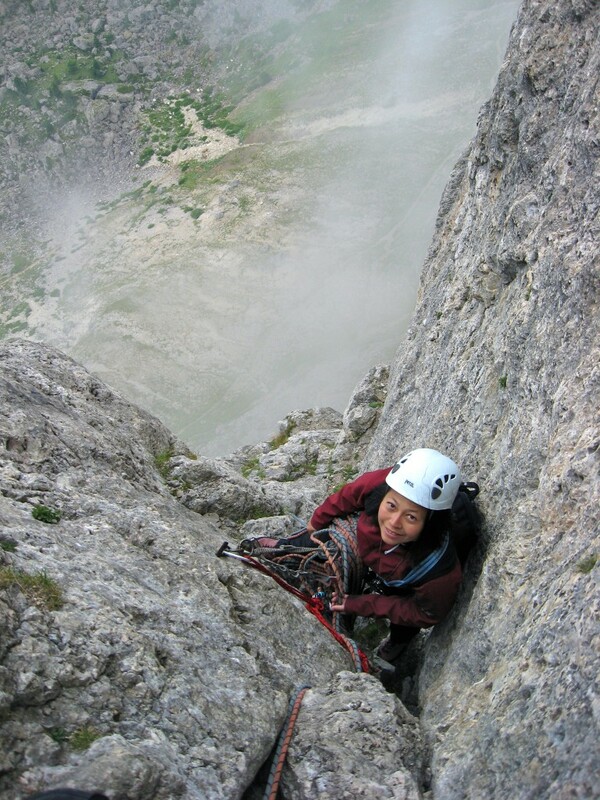 Shirley arriving on the large ledge atop pitch 4 of Trenker route (Aug. 2008). 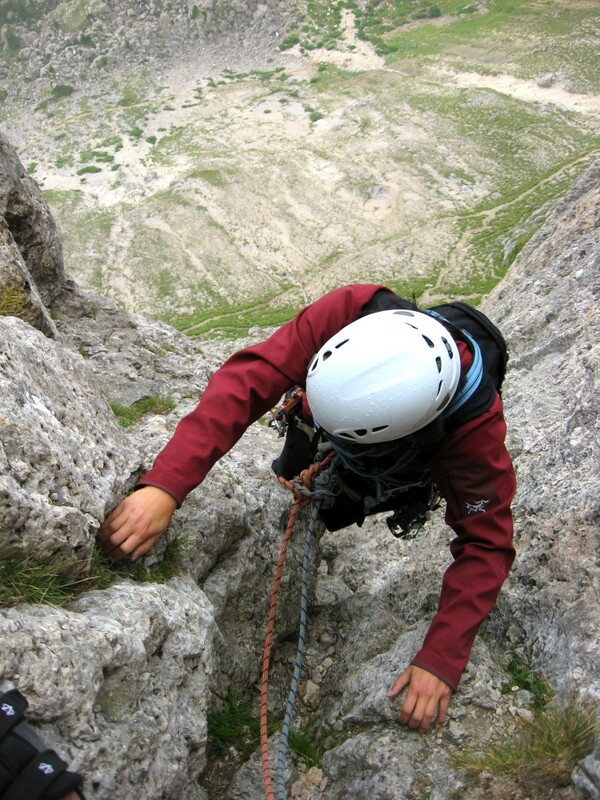 Leading a 3rd class traverse high on Trenker route of First Sella Tower (Aug. 2008). 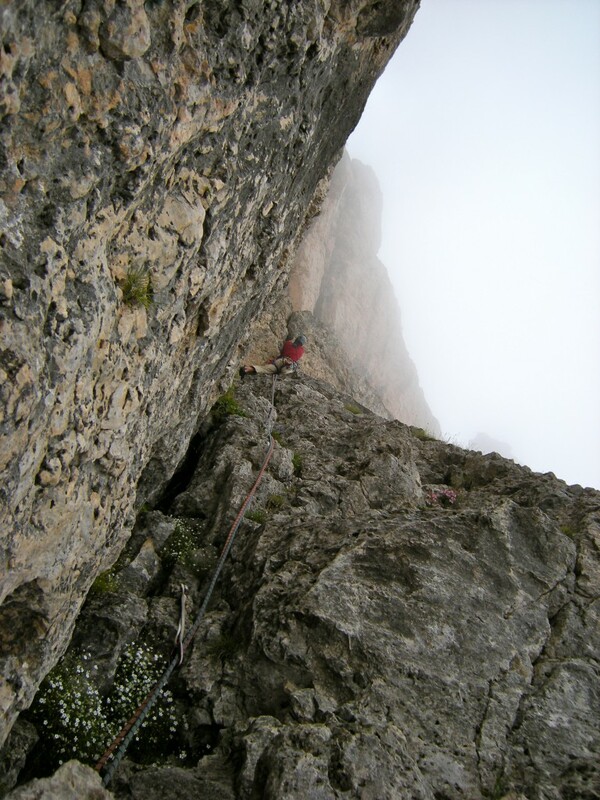 Shirley topping out on the Trenker route on First Sella Tower in a brief paus in the rain (Aug. 2008).